This is the chapter that expects to provide a basic idea about the entire study. The first section is going to discuss about the background of the study, the way of identifying the problem for the study and the significance of the study while the last section expresses the scientific way of getting the solution for the question and the sequence of arranging all the chapters throughout the study. In 1988, the group of Kelanka has commenced in Ehaliyagoda by the cooperation of two siblings who named as Mr.Rehena de Silva &Mr.Kapila de Silva. They are able to maintain a profitable relationship with more than 20,000 loyalty customer base by utilizing their 30 years’ industry expertise while possessing Rs.500mn annual revenue. Currently both of owners have maintained separate ownership of six showrooms. From among them, Mr.Kapila serves as the Managing Director by taking the ownership of the largest footwear showroom in Sri Lanaka which locates in Negambo while other two entities are operating in Horana&Awissawella . There isn’t a considerable level of variance in between expected & actual expenditure figures by last six months when comparing to the variance of sales income. These formal figure have given a clue that the problem is in the level of sales quantity. No repeated consumers even they have “Kelanka Hitha Mithuru Loyalty Card”. The data of periodical financial budget review report & informal talks with the relevant people have already shown the problem of decreasing the sales in Negambo showroom. The decision situation was refined by analysing the underlined causal factors which effects on decreasing the sales by giving the answers for the question series of Kepner and Tregoe. What is the state of disequilibrium affecting us? Decreasing the sales volume by last six months than the expected level. To whom did it occur? What is the urgency of the problem? Decreasing the sales of the largest showroom is directly caused to the profit of the entire organization. What is the interconnectedness of events? What result came from which activity? Source: Developed by the Student by basing on the Question Series of Kepner and Tregoe. The consumers are not treated well by the employees even not saying “Good Morning, Good Evening” & not say “Thank You” at the end of the service. The consumption of Leather products is decreasing at the world as trend of animal rescuing. The majority of the consumers in Negambo is Christians including larger composition of foreign consumers. They expect Non Leather products but our sales people are going to sell leather products to them without identifying the requirement of the consumers correctly. No team work only strives to attain individual sales target. A KPI system has combined with the salary scheme of Kelanka Group with the intention of enhancing the individual target achievement. The performance of KPI has measured periodically like three times per month. Therefore, it’s hard to find a team work among the employees. Not only in Negambo but also Avissawella & Horana respectively. The management position can be placed in to the position of “Inefficient +Ineffective =Non Productive Category”. Further means, the manager is more inefficient because in this situation organizational resources refer not only to raw materials but also related discouraging the usage of human effort while aiding little progress toward organizational goals. And also his efforts are not aimed at managing people in the organization, such activities include providing support & encouragement to others while empowering them to solve the problem. All these signs symbolize he is less talented in people related activities even being fluent in task & change related activities respectively. Identification of alternative solution to fulfil the need of decreasing the sales by correcting the underlined causal factors of management weakness & lower rate of consumer interest is going to clarify through this section. It is not an easy task like finding options to programmed decision which means they are not available within the existing organizational system. Because of the uncertainty & lack of information availability there are only three alternatives which can be considered to find the optimal solution. 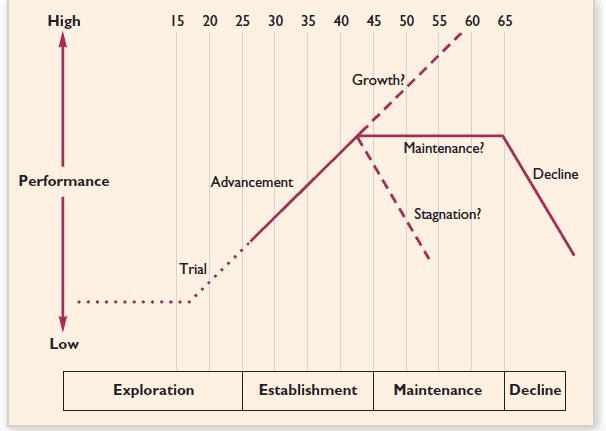 The career is generally viewed as evolving through a series of stages. These evolutionary stages are shown in figure 3.1. As likely mentioned at the first chapters, the manager is just only 32 years’ old who is a first class business management degree holder for recognized university in Sri Lanka. All means that he is in the exploration stage where at the beginning of career is characterized by self-analysis. The most productive management can be seen at the stages of establishment & maintenance which begins at the year range of 55 to 60. A study regarding new management position by Linda Hill, professor in Harvard University has revealed that, becoming manager is the transformation from “Individual Identity to Manager Identity” rather than learning a new set of skills. (Daft, 2010). According to that, the manager of Negambo showroom is a recently converted product to the management position from his two years’ executive role. That’s why he always strives to get things done through own effort & develops the habit of relaying on self rather than others. In contrast he must know, the way is as a manger, gets things done through other people by delegating to others & developing their ability. 2. Giving full training & development to the existing manager to enhance his skills & capabilities furthermore. A survey of the consumer behaviour in Kelanka Group which done by the marketing department has revealed that 68% of the consumers left the organization because of the weakness in the workforce. The HR policy of the entity is hiring people at low cost & enhancing them through the training & development. As a still growing small business organization actually they don’t prefer to spend much cost for hiring people. They have used this policy by ignoring the implicit cost of low cost hiring people which means, most of uneducated, unexperienced employee leave the firm easily by making the loss of entire cost which spent for training them. 3. Hire quality & experienced employees to the front level positions. Assign probability factorto each of the potential effect that is indicate how probable the occurrence of the effect would be if the alternative were implemented. After that, the comparison between each alternative’s expected effects & the respective probabilities of those effects. After that the manager will know which alternative seems most advantageous to the organization. Expected sales & cost proportion are shown by table 3.1. At the very first time, all the alternatives seem feasible. But when considering the expected value of the options, “C” is the best one which has the highest expected value. It means taking the consultancy from outsource organization while keeping existing manager in same position will be the best solution for the problem. The next step is to put the chosen alternative into action. Decisions must be supported by appropriate action if they are to have a chance of success. After the chosen alternative has been implemented, decision makers must gather feedback to determine the effect of the implemented alternative on the identified problem. If the identified problem is not being solved, managers need to seek out & implement some other alternative. The ultimate corollary of the case analysis was doneby utilizing the knowledge of managerial decision making & modern management concepts. Kelanka Group is a leading foot wear retailer which only behind DSI. The essence of the company is merely depending on Negambo showroom which is the largest footwear showroom in Sri Lanka. Contemporary issue is the decreasing of the sales without variance in the expenditure. After analysing the underlined casual factors reveal that the root cause is the weak aspects of the management which is rolled by a new manager. Becoming a manager is not a positive forward looking career because of it holds many challenges like increased workload, challenge of supervising former peers, responsibility of other people & etc. Three possible solutions could be developed for the selection steps. The theory of probability is discussed shortly to select the best solution. Give up command & control mind set to focus on coaching & providing guidance, creating organizations that are fast flexible, innovative & relationship oriented. Today, people are working at scattered locations, managers can’t continually monitor the behaviour of them. Therefore, it is better to set clear expectations, guide people toward goal accomplishment through vision, values & regular communication, & develop a level of trust in employees’ commitment to getting job done. “Team Building Skill” is better than managing a department of employees.